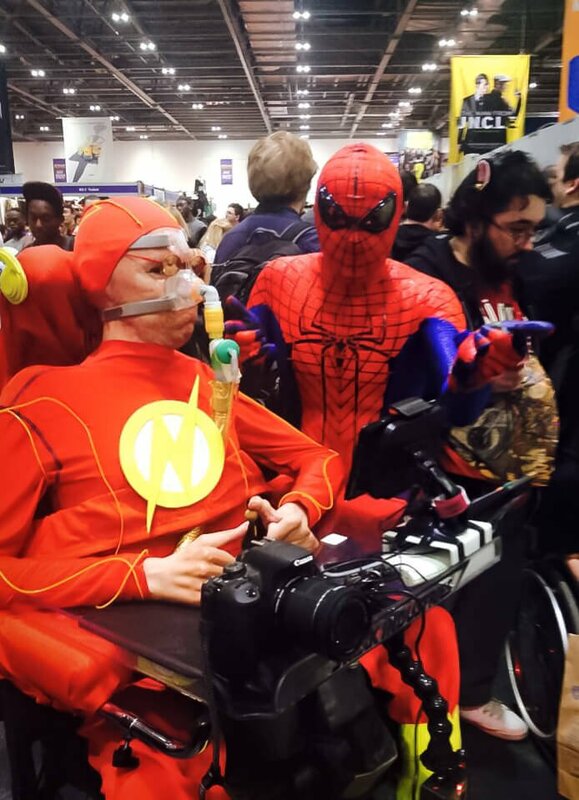 This will be a fairly short post with mainly pictures (they tell a thousand words you know), anyway I attended MCM London 2015 comiccon this year as wheelchair Flash. 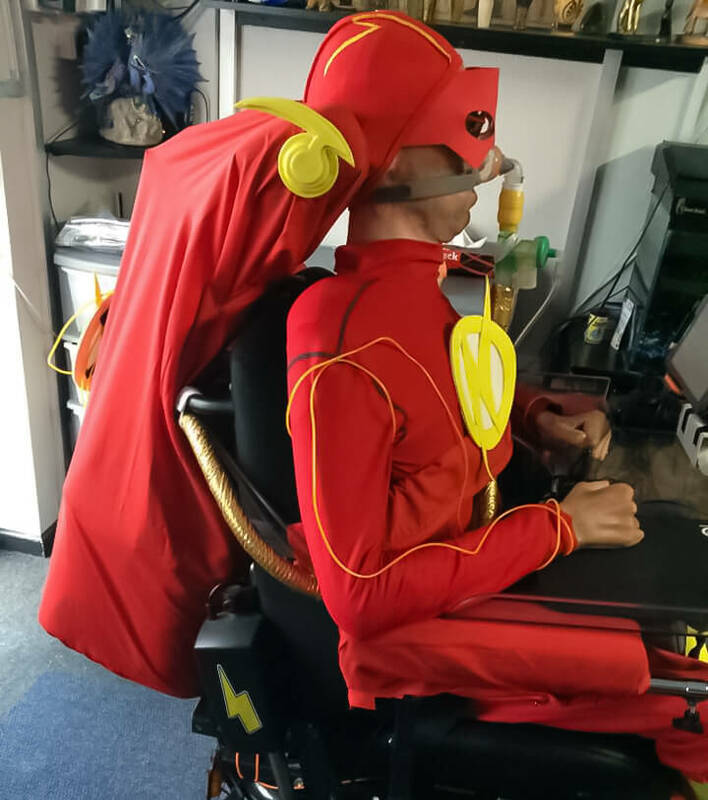 This costume was more prepared than my previous ones and got lots of attention at the show, and yes reverse Flash would have been more appropriate and I did consider swapping to it, I already had lots of bits for the costume though so decided against it this time. First attempt at a mask/cowl using Peoakura, it didn’t look great and was too big, back to the drawing board (the polystyrene head was purchased on ebay and surprisingly almost matches my real head perfectly). 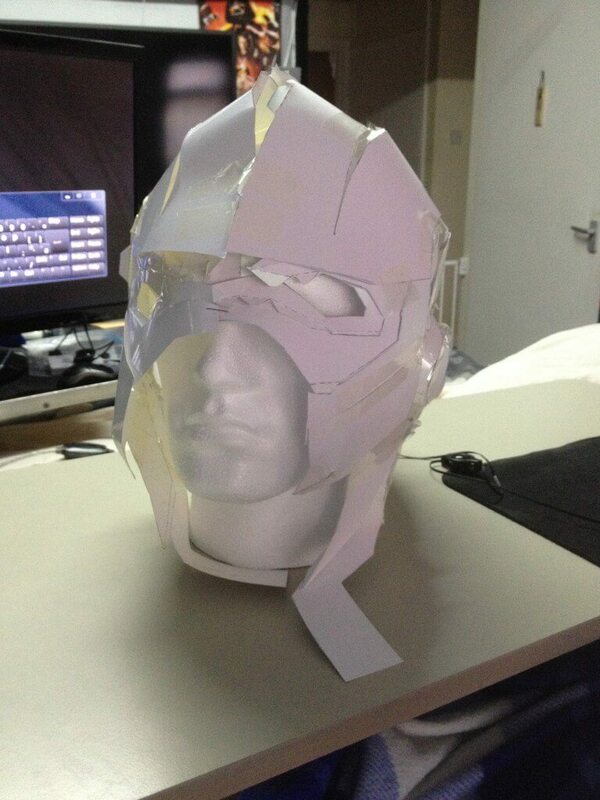 Second attempt was done using a masking tape and foil mold of my head, this was closer to what I was after but I discovered a serious flaw, my head rests on a headrest and this caused the mask/cowl to slip round my head while wearing it, back to the drawing board again. The final design ended up being a swimming cap painted with Flash lines, a red foam mask and an old pair of prescription glasses with their lense covered with gold coloured one glass film (I bought samples from ebay for 99p). I also got my PA to cut a red sheet to cover parts of my wheelchair, my seatbelt, armrests and footplates. Yellow Flash ears/wings were stuck to my headrest, EL wire attached, a foam Flash logo attached and red LED lights put on my wheel hubs. My final outfit, the top is a lycra ski/cycle vest with EL wire attached using invisible thread, I couldn’t find comfy red trousers so we cut a red children in need onesie in half, the mask looked good but obscured my view of the tablet that controls my camera so was left off at the show. Final costume at MCM London 2015. 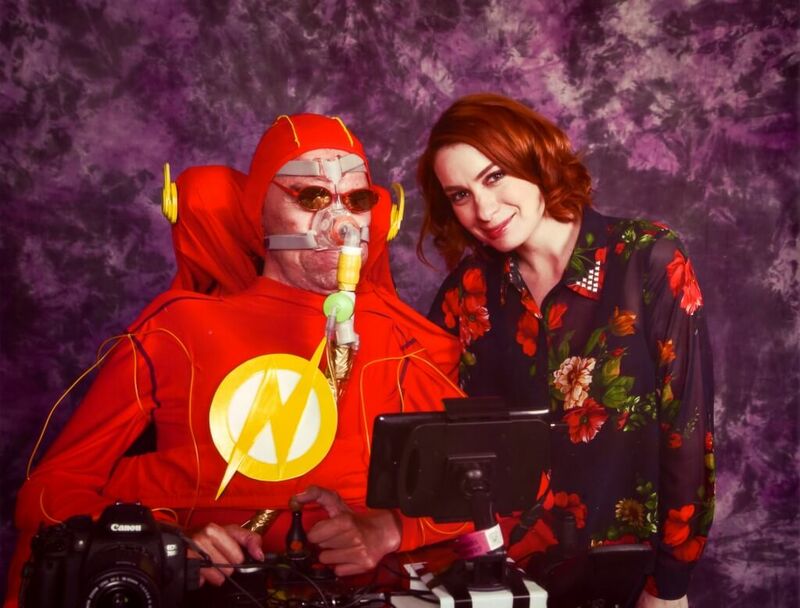 This entry was posted in Geeky and tagged Comiccon, cosplay, Daniel Baker, Duchenne Muscular Dystrophy, Frontier X5, MCM, The Flash. Bookmark the permalink.